This highly original work provides a thought-provoking and valuable resource for researchers and academics with an interest in genocide, criminology, international organizations, and law and society. In her book, Caroline Fournet examines the law relating to genocide and explores the apparent failure of society to provide an adequate response to incidences of mass atrocity. 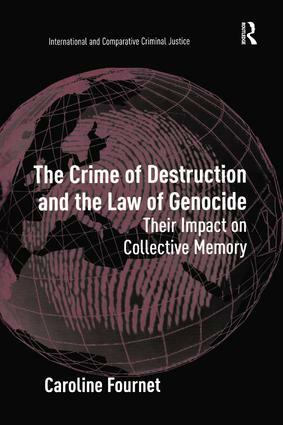 The work casts a legal perspective on this social phenomenon to show that genocide fails to be appropriately remembered due to inherent defects in the law of genocide itself. The book thus connects the social response to the legal theory and practice, and trials in particular. Fournet's study illustrates the shortcomings of the Genocide Convention as a means of preventing and punishing genocide as well as its consequent failure to ensure the memory of this heinous crime. Contents: Introduction: memory and genocide. Part I Specificity and Uniqueness of Genocides: The crime of genocide: 'A crime without a name'? ; Dehumanizing intent and death by destruction. Part II The Conventional Interpretation of the Specificity of the Crime of Genocide: The Restrictive Approach of the Genocide Convention: The conventional approach to the genocidal pattern of conduct: the omission of dehumanization; The conventional selective protection of groups: the omission of 'racialization'; The conventional approach to genocidal intent; The genocidal state; The conventional omission of genocide denial; The conventional restrictive approach and the jus cogens prohibition of genocide. Part III Consequences of the Conventional Restrictive Approach to the Crime of Genocide: The Inapplicability of the Genocide Convention and Its Impact on Collective Memory of the Crime: The symptoms of the inapplicability of the genocide convention: the lack of state practice; Legal memory: its impact on social and collective memory of the crime and as a tool against denial; Conclusion: forgiving the unforgivable? ; Bibliography; Index. Caroline Fournet is Lecturer in Law at the University of Exeter, UK. Her interests are in the areas of Public International Law, especially International Human Rights Law, Humanitarian Law, and International Criminal Law.